Mastering Voir Dire and Jury Selection | National Legal Research Group, Inc. 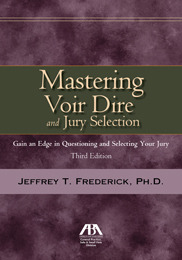 This much anticipated and expanded 3rd edition by one of the nation's most experienced trial consultants goes beyond other books on jury election and focuses on the skills needed to conduct effective voir dire and jury selection, ultimately improving your chances of a favorable verdict at trial. This valuable guide will help you understand effective voir dire and jury selection strategies and adapt them to the unique circumstances you face in your trial jurisdiction. You will find expanded discussions of developing voir dire questions, good questioning techniques and skills, reading jurors’ nonverbal behavior, successfully overcoming common problems encountered during voir dire, the use of juror questionnaires, the impact of the Internet on jury selection and jury trials, and overall jury selection strategies. The appendices containing samples of important voir dire questions in criminal and civil cases are expanded.